The Microsoft Bott continues his war on Theora this week, so Chips B. Malroy responds by calling him “major Microsoft shill” (which is actually true because his career is dependent on Microsoft). Malroy added that “audio and video codecs and the patents on them, are in some ways, an attack on the right of free speech” and later he argued that: “Most of us do disdain software patents. They only help the monopolies. They do not promote science or innovation. But there is a worse form of software patents, its software patents on codecs. This should never have been allowed in any reasonable world. Software patents on multimedia codecs are basically a patent on sight and sound, two inalienable senses of the human experience. “Beyond that the monopolies (Microsoft and Apple) want to use software patents as a way to block free operating systems, to control the web, and to profit by taxing those who have to use these multimedia video and sound software patents. “Multimedia software patents are completely against the idea of standards, or even standards that can be freely used on the web. We must try to educate those in power to reject software patents on video and audio codecs and to get free standards on these codecs for a free web. Not a web that will be controlled and taxed further by unnecessary Microsoft and Apple lockin. We’ve all heard how the h.264 is rolled over on patents and royalties. Even with these facts, I kept supporting the best-performing “delivery” codec in the market, which is h.264. “Let the best win”, I kept thinking. But it wasn’t until very recently when I was made aware that the problem is way deeper. No, my friends. It’s not just a matter of just “picking Theora” to export a video to Youtube and be clear of any litigation. MPEG-LA’s trick runs way deeper! The [street-smart] people at MPEG-LA have made sure that from the moment we use a camera or camcorder to shoot an mpeg2 (e.g. HDV cams) or h.264 video (e.g. digicams, HD dSLRs, AVCHD cams), we owe them royalties, even if the final video distributed was not encoded using their codecs! Let me show you how deep the rabbit hole goes. Canonical licenses H.264 – Theora out for the count? Canonical are currently the only Linux company to license H.264/AVC, the patented non-free technology used to compress video and favoured by companies such as Apple & Microsoft for HTML5 Video. Neither RedHat, makers of Fedora, or Novell, makers of Suse, appear on the list of over 800 licensee’s. What’s interesting is that the rival, if you will, to H.264 is the free and open codec Ogg Theroa which one would naturally assume would be the favoured choice for a Linux distribution’s parent to support. Let us remember that MPEG-LA's CEO (Larry Horn) is a patent troll. TechDirt has just caught up with this news. Joe Mullin has a great blog post, looking in detail at MobileMedia, a recently launched “company” that fits all the traditional characteristics of a “patent troll” or “non-practicing entity” (if you’d prefer). It doesn’t appear to do anything but hold patents, demand licensing fees and sue. So what’s so interesting about this one? Well, it’s a subsidiary of MPEG-LA, the company that manages some important digital video standards, and manages the patent pools related to them — and both companies have the same CEO. In the meantime, while all this has been going on, it’s worth noting that Steve Jobs — one of the targets in this lawsuit — has apparently been telling people that MPEG-LA is getting ready to sue open video codecs, such as Theora, for patent infringement. Of course, such threats have been made before and never carried out — but if MPEG-LA now thinks that suing for patent infringement (rather than just alerting the patent holders to possible infringement) is the way to go these days, perhaps the lawsuits above were an opening salvo. MPEG-LA is hardly a legitimate business if it bullies like this, but ISO, which is a farce that sells out to whoever has enough money to corrupt it, won’t do anything/much to stop this. As the president of the FFII put it yesterday, “ISO [is] pushing for a patent-free video codec, committee stuffing, yes you can do it [...] The analysis of patents is outside of the scope and competence of ISO and MPEG [...] MPEG believes that 20 years after its publication some technology will become royalty-free” (posted in Twitter). As I wrote about earlier, there has been a horse race going on about which video codecs will be supported by HTML5. With the stakes so high, the race is starting to get a bit rougher. Now it is turning into a tag team match, with Apple and Microsoft on one side and Google and Mozilla on the other. This past weekend both Apple (of the open standards according to Steve Jobs) and Microsoft (never afraid to assert an alleged patent claim) have supposedly put down the hammer that Ogg Theora (supported by Mozilla) and other open source video codecs may violate patents. This sets up an interesting tag team match. 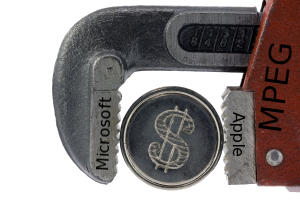 On one side, the defenders of “open standards that we like” Apple and Microsoft. In the other corner, the open source champions Google and Mozilla. Hey maybe Adobe can be the guest referee? The winner of this match will determine what technology will underlie the video you watch on the web or your TV in the future. Will Apple put its lawyers behind the open codec patent attack? All this makes the pending decision in Bilski vs. Kappos, still unknown at this writing, so important. A decision that encourages Apple to proceed, especially against Google, may make for the biggest lawsuit of all time. Apple has already sued Android through HTC. The word about Immunet’s free anti-virus solution is spreading fast. The agent installed on my computer tells me that there are currently 162,597 people in the Immunet Cloud, and that I’m protected from 12,637,576 threats. When I first installed it almost a month ago, the number of users was around 122,000.